When I was a teenager growing up in Pittsburgh, PA, I often made a beeline to a store called National Record Mart. In those prehistoric days, the shrinkwrap on the LPs meant that a pre-purchase test run wasn’t really possible. There I would disburse some of my hard-earned dollars from my paper route for classical or jazz LPs, then race home to play them on the family Dual turntable, which hailed from Germany’s Black Forest region. I listened with rapt attention—and sometimes with disappointment to a recording that wasn’t up to snuff. So when digital appeared in the early 1980s, my impetuous teenage self welcomed the demise of the LP. The future had arrived, or so I thought. I distinctly remember hearing the local WQED classical radio station play its first digital CD, a recording of Beethoven’s crowd-pleaser “Wellington’s Victory,” and announcing to all and sundry that the disc was the cat’s meow. My father, however, took a different view. An inveterate fuddy-duddy, he disclosed to me years later that he had visited the downtown National Record Mart to scoop up a bunch of vinyl that was being sold at dumping prices. Unlike me, he was always unmoved by the claims of a revolution in recorded sound, raising his eyebrows questioningly when I touted the obvious virtues of the new digital era. Flash-forward to today, and the verdict is rather obvious: My old man had it right all along. He’s using a VPI Scout these days, and I’ve become what you might call a vinyl recidivist. On recent trips to Paris and Berlin, for instance, I made sure to pick up some choice Decca LPs as well as some gorgeous Berlin Classics 180-gram reissues that were originally recorded in East Germany (Chad Kassem’s Acoustic Sounds also carries several of the Berlin Classics). It’s my sense that for the first time, audiophiles are really able to tap into the true potential of what engineers captured in the grooves decades ago. The quality of playback has advanced so rapidly—whether it’s cartridges, tonearms, or turntables—that it’s riveting to hear how far the boundaries of music reproduction can be pushed, as well as to discover what can be produced at less-than-Olympian price levels. Enter the Spiral Groove SG1.2 turntable. In contrast with the cost standards of the six-figure turntables floating around out there—including a spanking-new Air Force Zero that’s pegged to come in at a cool $350,000—this new ’table from Allen Perkins is not priced in the stratosphere. It retails for $30,000 sans tonearm and for $36,000 with his Centroid ’arm (for those of you with an SG1.1, your ’table is fully upgradeable). Mind you, as the owner of a Continuum Caliburn, I’m hardly in a position to knock the battleship approach to turntable design, nor is that my aim. What I’m trying to say is that Perkins has deployed his fertile mind to provide as much value as possible in a relatively small package. In fact, I would say that his turntable is rather deceiving, as it packs a far greater sonic punch than you might expect from a casual look at it. What’s more, Perkins, an accomplished drummer and gifted designer of audio equipment, is a patient and mild-mannered soul who is less than inclined to make a fuss about the merits of his gear. It is only when you take a closer look that you begin to appreciate the effort and care that went into designing and producing the tonally pure Spiral Groove. For starters, the belt-driven Spiral Groove SG1.2 is dense, clocking in at 80 pounds. The platter has an embedded and oversized outside stainless steel ring that is supposed to provide additional inertia by simulating the benefits of a heavier platter. 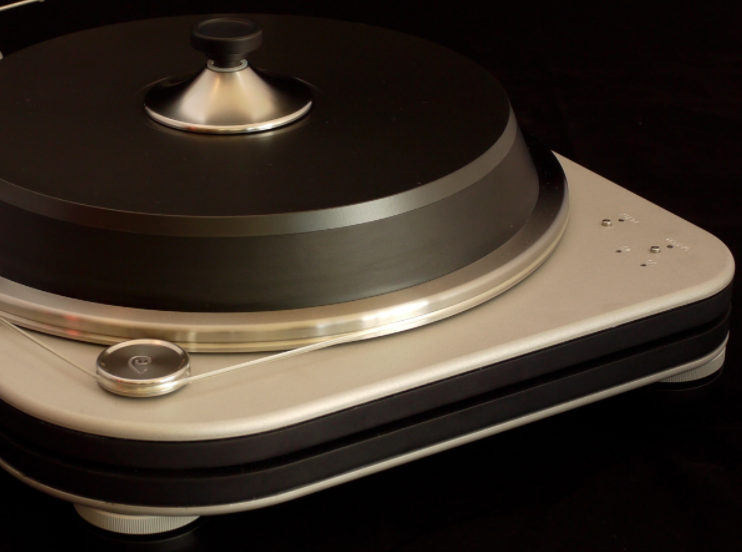 The body of the turntable is made of four aluminum layers that are set in two independent, constrained-layer platforms. The various parts of the turntable are attached to the separate platform layers—one supplies a base for the motor and the other is for the platter bearing and ’arm mount. The feet of the ’table use proprietary Strange Attractor technology and are only attached to the bottom-most layer. All of these approaches are aimed at combatting pesky resonances that interfere with pristine playback. Perkins is very proud of his design, and rightly so. Other manufacturers, he intimates, have picked up on its merits. In many ways, the bearing is at the heart of the Spiral Groove SG1.2’s innovative design. It incorporates a steel ball and sapphire thrust plate that uses magnetic technology to reduce the weight on the sapphire to two pounds. Perkins offers—and I rush to assure you that this isn’t “fake news”—nothing less than a 20-year warranty on the bearing. In addition, the Spiral Groove uses an outboard power supply to drive a high-torque, AC-synchronous motor that runs at either 33 1/3 or 45rpm. It’s possible to use different armboards and thus tonearms on the Spiral Groove but I employed Perkins’ nifty 10" unipivot Centroid tonearm. Using something called “Balanced Force Design” to optimize its performance, Perkins claims “near-perfect” tracking for his ’arm. Like all unipivots, this ’arm needs to be handled with care as it can easily bounce around. Perkins mounted my Lyra Atlas on it. Overall, I never had any hiccups with performance, and this armboard/tonearm combo’s design looks to be bulletproof. I don’t mean to natter on excessively about the technical prowess of the ’table, but given its unobstrusive aesthetics, it’s important to remember that there is a lot going on with the SG1.2’s mechanics. The aim of all the aforementioned design measures is to lower the noise floor as much as possible, and here Perkins has succeeded very well indeed. The first thing that struck me about the turntable was the superbly quiet backdrop to the music that it plays back. The Beaux Arts Trio recordings of Haydn are some of my favorite LPs on the Philips label. They are fairly simple works—particularly the early ones—but precise and beautiful. Their simplicity places a premium on quiet reproduction and the tonal beauty of the instruments. On Papa Haydn’s piano trio in E Flat, No. XV, the limpidity of Menahem Pressler’s piano came through superbly; his notes hovered in space and the Spiral Groove delivered a tactile sense of the pianist’s touch. These pieces almost sound as if they emanate from a jewelry box, and the Spiral Groove tracked the instruments with laser-like focus. These virtues also came to the fore on a DG recording of Dietrich Fischer-Dieskau and Gerald Moore playing Schubert’s songs from Goethe. The combination of Atlas cartridge and SG1.2 seemed to slice through the grooves to provide a sense of the physicality—the rich, resonant quality—of Fischer-Dieskau’s baritone voice.